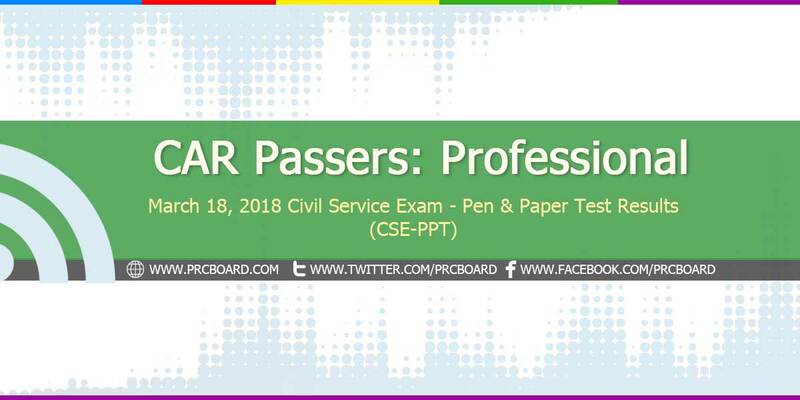 MANILA, Philippines - The official results, list of passers, top examinees and other important announcements for March 2018 Civil Service Exam - Pen and Paper Test (CSE-PPT) both for professional and subprofessional levels are released by the Civil Service Commission (CSC) within sixty (60) days after the eligibility examinations. Below is the complete list of passers for March 2018 CSE-PPT Professional Level in Cordillera Administrative Region - CAR (Region 14). 693 HONRADA, ROMULO JR. C.
Lord answer my prayer i hope u granted my wishes and prayer .. Waiting for good result of professional civil service.. I highly agree with you! Let's just hope for the best. I feel you.. Let's just hope for the best and pray. That's right! But I still believe in luck! whatever the results may be still thank you lord. In God's Grace papasa po tayo. Tiwala lang.. Hoping for the best.. I claim it Lord. My Lord Jesus i trust in you answer my prayer i'm declaring it but what ever the result is.. i know you have always a plan for me..
sana kasama pangalan q sa mga nakapasa...amen. Is there a way po to check yung score/rating? This cause for a celebration! After a second take, I finally passed the exam. Thank you lord. For those who did not make it, folks, don't lose hope. Thanks God. He answered my prayer..god is really good and great.